Rather that owning the piece, the piece owns her, never mind the fact that her haircut is totally unfit to hold a tiara. Princess Margaret was a stunning looking woman when she was younger. I saw a family portrait at Sandringham. Princess Margaret must have been in her late teens and looked natural and really beautiful. IMO she was on a par with Diana but did not age well. IMO Margaret was not very pretty but she had "something" that made her look special. ITA there was something there just off that made her looks quite interesting. David Cameron says the Koh-i-noor diamond, which Britain forced India to over in the colonial era, will not be returne. The Prime Minister ruled out handing back the 105-carat diamond during a speech on the third and final day of a visit to India aimed at drumming up trade and investment. The diamond is set in the crown of the late Queen Mother and is on display with the Crown Jewels in the Tower of London. She was the American society beauty who captured the heart of a king and changed the course of British and Commonwealth history in the process. Now a stunning collection of jewels that shed light on the extraordinary love affair between Wallis Simpson and King Edward VIII are to go on sale at Sotheby's. Among the pieces to go under the hammer on the 12th December is a silver watch that tells of Simpson's heartbreak after being forced to separate from her future husband in the months leading up to his abdication. The keepsake, which was sent to Edward VIII in 1937, even bears an inscription in Simpson's handwriting, which reads, simply: 'Wallis Easter 28 - III - 37 David'. Also included in the sale are examples from Simpson's magnificent jewellery collection, among them a stunning sapphire bracelet by Cartier that is expected to fetch between £130,000 and £180,000. I have the most awful opinion of those two - I would never want any of their jewels etc. He was so narcissistic and she was so brutally ambitious. And then there are all those rumors about the two of them. But for certain - well documented by legitimate historians - he was a Nazi collaborator. Vile. it can keep the Elgin Marbles company LOL - the Greeks want those back too and they ain't getting them! It's interesting that Cameron has decided to make this statement at this time. Obviously the UK govt is not scared of any trade consequences from India at the moment. I am not sure that it will always be this way. A COLLECTION of precious royal jewels which offers an insight into the love affair between Edward VIII and Wallis Simpson sold at auction for £620,125 yesterday. Bidding vastly exceeded expectations at nearly £270,000 above the estimate. The collection includes jewellery and trinkets exchanged as gifts between the couple, and includes pieces from luxury jewellers Cartier and Van Cleef & Arpels. 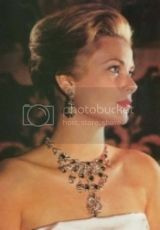 Bryony Meredith, head of Sotheby's London jewellery department, said that the level of bidding demonstrated a "longstanding fascination" for the lifestyle and taste of Edward and the Duchess of Windsor. Ms Meredith believes the sale attracted so much attention because of a continued interest in the royal love affair, as well as the items' royal connection and high quality. She said: "On the rare occasions when they have surfaced on the market in the last 30 years, jewels from their collection have consistently set new benchmarks and today was no exception. "The offering included not only masterful examples of twentieth century jewellery but also pieces whose intimate inscriptions trace the life of four generations of British monarchs and tell what is perhaps one the greatest love stories of our times, the romance that led Edward VIII to abdicate the throne of Great Britain." The romance between Edward and American divorcee Wallis Simpson sparked a royal scandal and fears of a constitutional crisis. At that time, the Church of England - of which Edward as monarch was the head - did not allow marriage between divorcees and so Edward was forced to choose between the throne and his relationship with Mrs Simpson. LOL this is the main problem if they gave the diamond back they would have to start giving back most of their important collections. yeah - can you not just see the Queen handing back the Vladimir and Kokoshnik Tiiara's to Putin? Yes, but then we'd get pictures of shirtless Putin on a unicorn in space, wearing a tiara. I laughed so hard I spilled my tea! What an image. ok sorry for souble post but they are weeks apart - was reading a great web site on vintage fashion etc - the Queen's wedding dress had 20,000 pearls on it - they had to come from the US because wartimish and so Britain did not have that many pearls. Her coronation dress only had 10,000 pearls on it. The silk for her wedding dress came from scottish silkworms because again - it was unpatriotic to use Japanese silkworms. Sadly - the silk has rotted and the wedding dress is in rough shape. So what happens to those pearls? 30,000 pearls has to be worth a bit of money - in the case of the coronation dress I guess they just stay on - but as the wedding dress is rotting - do they re use them? The purple robes are made from hand woven velvet and have honest to goodness gold buliion embroidery.